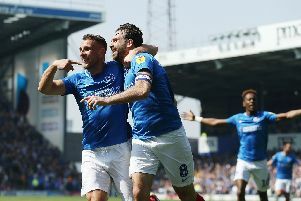 MIKEY HARRIS paid tribute to first-team duo Adam Barton and James Dunne as Pompey reserves beat Cambridge United 2-1 in their Final Third Development Cup semi-final at Bognor today. It was a scoreline that flattered the visitors, who were comfortably outplayed by a side comprised almost entirely of Academy players. The two exceptions to that rule were Barton and Dunne, who occupied the midfield anchor roles in the Blues’ 4-2-3-1 formation. Youth-team captain Calvin Davies wore the skipper’s armband and led by example to fire Harris’ side into a 1-0 half-time lead at Nyewood Lane from the penalty spot. It was one-way traffic in the opening 45 minutes but the home side paid the price for missed opportunities when pegged back on the hour mark. But Adam May, who combined brilliantly in an attacking quartet comprising Brandon Joseph-Buadi, Christian Oxlade-Chamberlain and Liam Sayers, headed home a deserved winner. Youth-team coach Harris led the reserve side, who will be disbanded after the final, in front of onlooking Blues boss Paul Cook and assistant Leam Richardson, and was happy with the performance. He said: ‘Dunney and Barts came into the team and I was really impressed with both of them in terms of their attitude and their application. ‘They both played excellently and dominated the ball in the middle of the park. The only slight frustration from the afternoon was the home side’s inability to make the victory more emphatic. Harris added: ‘We genuinely could have been five or six goals up at half-time and I am not exaggerating. Triallist winger Harrison Gilkes – a former AFC Bournemouth youngster – came on for Pompey reserves as a second-half substitute.